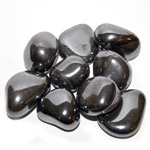 Hematite is known as a stone for the mind. It brings mental organization and is very grounding and calming. It helps with original and logical thinking and decreases negativity. Use it to help balance the body/mind/spirit. Physically it has been used to keep the body cool, to decrease blood disorders, nervous problems and insomnia.